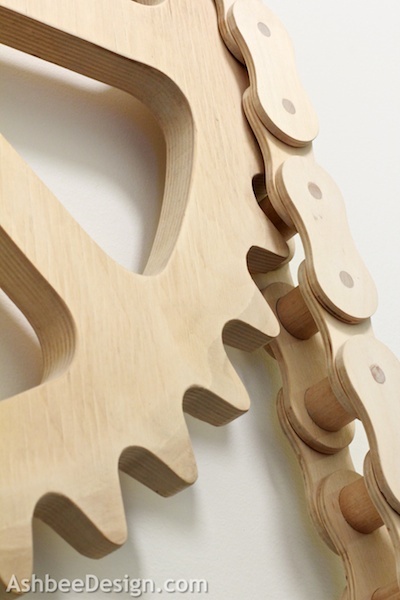 Ashbee Design: Wooden Bike Chain- Almost 40 years later! I went to RISD (Rhode Island School of Design) and while there I majored in sculpture. Wood was my material of choice. (I still love it. Just check out my Pinterest Board on Wood!) I spent long hours in the furniture woodworking lab making anything but furniture. Not totally true, I did do some furniture design. But mostly I was enthralled with wooden machines. 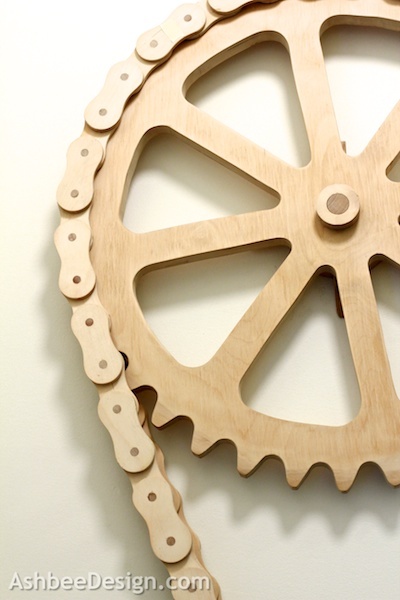 I designed and built a number of them and my most successful was a large wooden, operational bicycle chain. 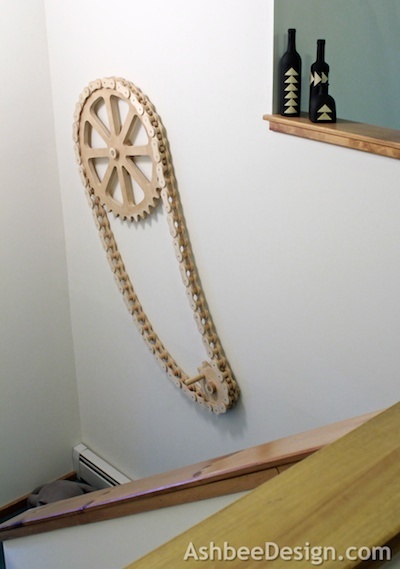 I had meticulously handcrafted and assembled about 10 feet of wooden chain links and two gears. The entire apparatus got mounted on a wall and it was fun, participatory art. 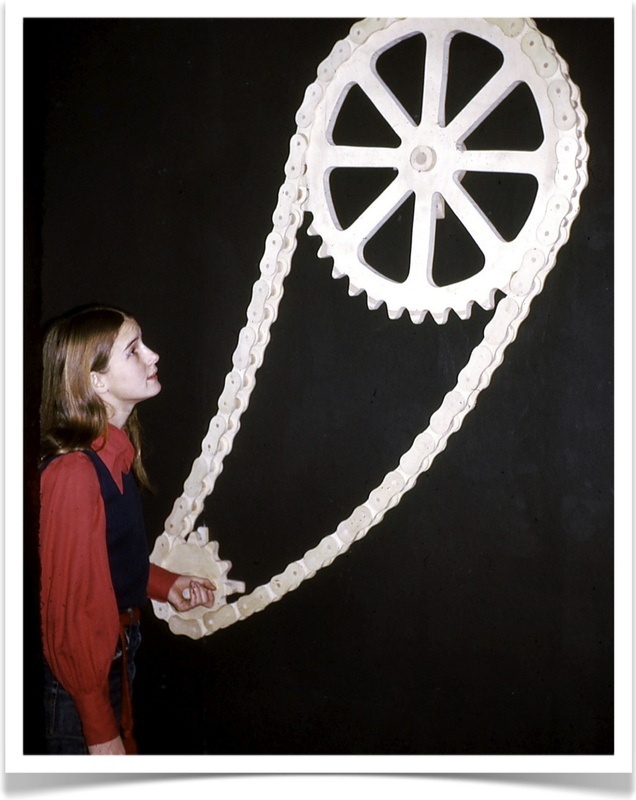 Here I am 39 years ago demonstrating the finished sculpture. Meanwhile the chain fell into disrepair and was reduced to hundreds of pieces in a brown paper bag hidden in the storage room. 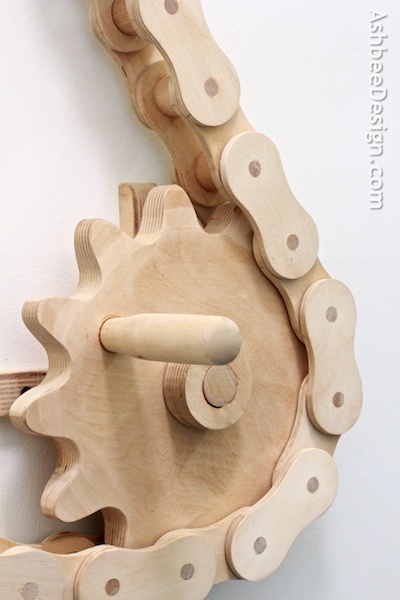 Recently, David requested that I refurbish it so it could be mounted in the entry area of the gallery space in his studio. This weekend, I approached the task, disassembling the entire thing, re-sanding and gluing it all back together. We mounted it in the stairwell entry and now, when people ask how he got started in his unusual career, he can point directly to the early inspiration! Life continues to be a fun, unusual, collaborative and creative journey! Truly unique and very special. RISD - WOW! Not really surprised. But still, very impressed. P.S. You look about 12 in that picture - too young to be an art student. Would you believe I was 21? And soon to be teaching high school art ( still looking 12!). Most students looked much older than me! Thanks for visiting and commenting. I would have put it in our home at one point as well- just not enough wall space. 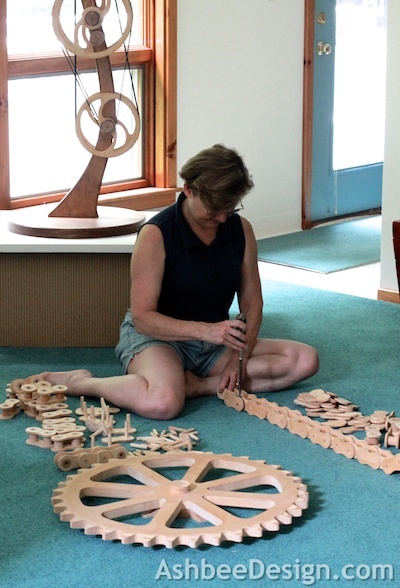 My husband makes wall mounted kinetic sculpture plus we have lots of large windows - both things I love. But it severely limits the amount of wall space for large decor items. What an awesome piece! I love that it actually works. I'm glad you refurbished it and gave it a place of honor. It certainly deserves it. Thank you for sharing it at What We Accomplished Wednesdays. Have a great week! What a great story! I have to share this with my son who is an avid cyclist. Such a unique, interesting, creative, piece of art - just love it. The initial inspiration came to me after David and complete a bike trip across the USA in 1972. We biked 3652 miles from CT to OR. So it was kind of a tribute to that trip. What beautiful story. Your initial piece is fantastic.